How do you say “crib” in Spanish? What’s the word for “crib” in Spanish? Here in Chicago, water cribs bring drinking water from Lake Michigan to the city. 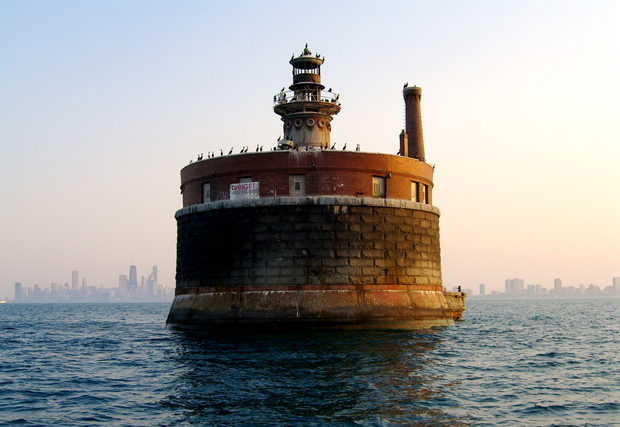 The first one was constructed almost 150 years ago two miles out in the lake, far from urban pollution, an engineering feat in its time. But if you ask the average bilingual person about crib in Spanish without any context, they’d say “cuna.” I’d say “cuna.” It’s the most common meaning. But context is everything. Cuna doesn’t feel right in this instance. So let me check. If I open up the Oxford Spanish Dictionary, an excellent bilingual source, and look up crib, I get cuna for “children’s bed”; or belén for “nativity scene”; or chuleta for “cheat sheet for an exam.” None of these seems right. I’ve never heard or read those words used to refer to an industrial-sized construction. So let’s look at the meaning of crib in English in the American Heritage Dictionary. One of the meanings is “5. A framework to support or strengthen a mine or shaft.” If you think about it, a crib (for children) is a framework around a bed so babies don’t fall out. This might be the real term we want to translate: framework. Maybe I should call up Chicago Water Management to see if they have a Spanish-language term. This is a multi-lingual city, after all, and the utility would be the authoritative source. Or maybe I could contact a Spanish-language news outlet to see if they’ve already wrestled with the question. This is why a translation can sometimes take a lot longer than you might expect. Words that look simple hide linguistic landmines. And sometimes accuracy reaches life-or-death urgency, such as the translation of a medical record for someone critically ill, or the instructions for operating a nuclear power plant. This is why translators specialize. They build up their vocabularies. In any case, how does Chicago’s water taste? Fine. And unlike some locales, Chicago has a virtually never-ending supply coming in through those cribs. This was cross-posted on Facebook, and my friends and friends of friends there offered excellent suggestions. Now I'd like to hear the Spanish term used in Chicago! I've never heard the term 'water crib' before - and, in fact, I'm not familiar with this type of near-surface water intake. I'd probably go with 'water intake' (also the term used on hydrological maps) and give an explanation - this does not strike me as a term, but rather as a concept. Yes, "water intake" is probably good: entrada del agua. I'll keep an ear out for what Spanish-speaking people here call it. Although probably they say "el crib."